This traditional, belted, Kimonostyle robe is perfect for lounging or to keep the chill away. 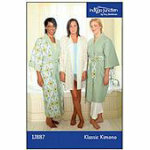 Whether you like your robe short, medium or long, this Kimono has a length that is sure to please. Optional trim on the sleeves matches the front trim and adds a touch of contrast. Inseam pockets are included. Sizes XS 2XL.